The president was joined by wife Melania, son Barron and top aides Monday afternoon to view the spectacle from the portico overlooking the South Lawn. WATCH: Total eclipse crosses the continental U.S.
For those unable to visit a spot on the 3,000-mile-long, 70-mile-wide path of totality, you’re in luck. In partnership with NOVA, NewsHour will be streaming the solar eclipse event all afternoon. These photographs capture the eclipse as it crosses the continental U.S. If you plan to join the 5,000-year-old tradition of eclipse watching next Monday, here are five things you need to remember. 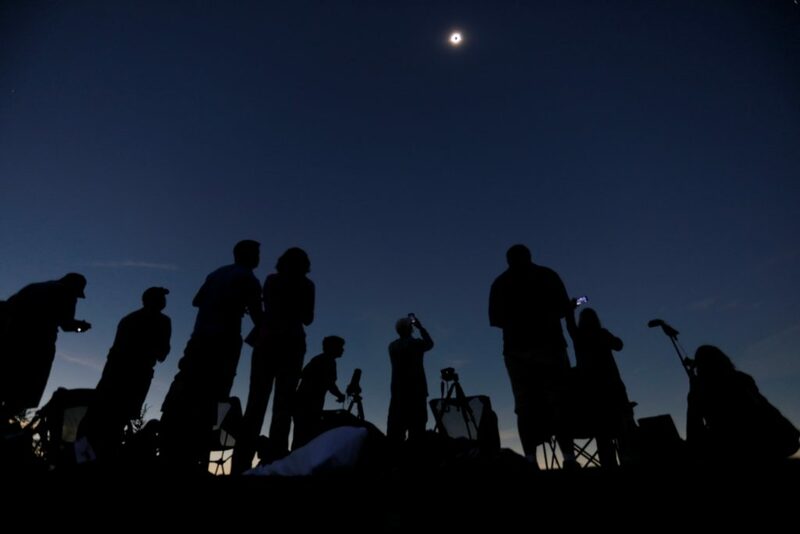 Today’s instant global connectivity makes whole new kinds of citizen science possible during a solar eclipse. Amazon issued a recall for some eclipse glasses sold on its internet marketplace, but did not publicly list the offending vendors or brands. A total solar eclipse captivated millions of people in parts of Asia and the Pacific last night. On Friday the moon will slide between the earth and the sun creating a total solar eclipse that only part of the world can see. How else can you watch this rare event? Try online.